The atrocities of the Salem Witch Trial echo throughout American history as a reminder of fake accusation, religious fanaticism, and blunders in politics and government. Though Salem, Massachusetts will never escape its past, it has turned its ancestors' crimes into something positive (and marketable). 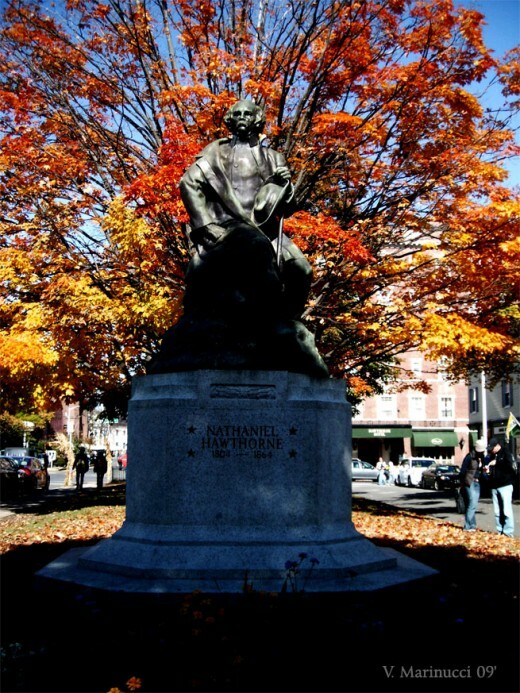 But, is Salem worth the visit or just a tourist trap? Well, me and some friends set out the weekend before Halloween to find out, and it is not. 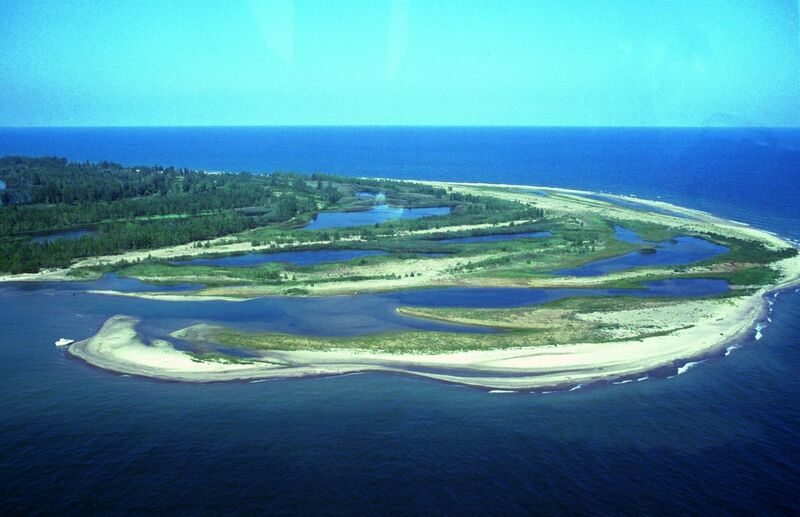 In fact, there are so many museums, tours and other activities it is hard to choose which. Though our group didn't visit everything, we covered plenty. Some were great, and some not so much. Is Salem worth trip? What activities to do, places to see and places to eat at are worth the time and cash? And, what is not? Reading on will help answer these questions. In the heart of Salem you will find many quirky restaurants found nowhere else. Though, if you need to have your T.G.I. Fridays, all the commercial restaurants can be found on the outskirts of the city. My friends and I stuck to the non-commercial. The Upper Crust- We ventured here our first night for some pizza. We had the veggie lover's pie topped with onion, mushroom, pepper and broccoli along with the sauce and cheese. Thin and crispy, it was a decent pie at an average price ($20 for a large pie). Another friend had a personal calzone with wheat dough, which she said was great. It was quite small though. The service was friendly and quick. I'd visit again. Red's Sandwich Shop- Well, as its name boasts, this restaurant is about sandwiches. 3 out of 4 of us were vegetarian and other than an egg sandwich they only had an eggplant parm sandwich for us. They were out of eggplant, so instead we ordered half portions of mac'n'cheese and fries. Our yappy waitress forgot to put our fries in, put in whole orders instead of halves for the mac, and then blamed the mistake on the cooks when she showed us that she did write full orders. 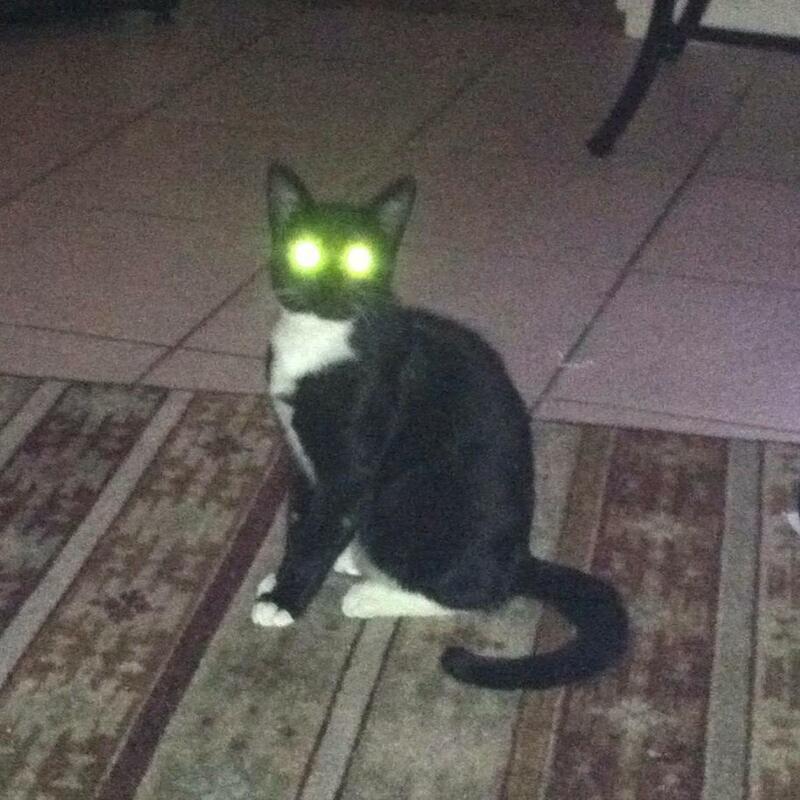 Oy. My meat-eating friend ordered pasta and salad which was good, she said. We didn't get any sandwiches, so it's not fair of me to say this place, food-wise stunk (though the mac 'n' cheese was gross). I'm sure Red's has good sandwiches, but I can't vouch for that. Rockafellas- For our final meal in Salem, we chose this restaurant on Essex Street. The place was large with a bar, a stage and big dining area. I had a veggie wrap with fries, which was tasty (especially the fries). However, dessert really was the restaurant's crowning moment in my eyes. I had a chocolate-covered pyramid full of fluffy mousse while my friend had a slice of hazelnut cheesecake. Both were heavenly. The pricing was very good (I thought it would have been expensive) and our waitress was pleasant. I highly recommend Rockafellas, especially if you like live music and dancing (which they have at night). There are plenty of other places to eat, but for our two nights in Salem these are where we ate. October is understandably Salem's most active year. There is more than enough to keep you busy during the month--probably too much to even cover. My friends and I always were finding new tours, museums, and performances to do. But, we did plan it out beforehand primarily, because most events required prior reservations. Keep this in mind, and make reservations online. Now, on to what we did. The Wax Museum and Haunted Houses- Our first night we went to the Salem Wax Museum. This was one of the few places where reservations beforehand were not necessary. Located next to Salem's oldest cemetary, the Wax Museum was in the middle of a bunch of circus tents and Halloween décor. Behind it was an amusement park lit up my a ferris wheel. We were disenchanted by the museum's cheesiness, expecting a building more along the lines of the wood ones in Hawthorne's "The Crucible." Yet, we paid the 18 bucks that covered the Wax Museum, and the two haunted houses, the "Witch Village" and "Frankenstein's Laboratory." The museum displayed decent wax figurines of Salem's past figures such as Hawthorne, John Proctor from the trials, Judge Hathorne who convicted the supposed witch trial witches, and the witch trial victims. There were two rooms of these figures and scenes, and then downstairs was a 'hands-on' room full of little crafts, which you had to pay for. Connected to that was the gift shop. Rather disappointing, but we hoped the haunted houses would be better. So, we went through both haunted houses which took maybe fives minutes at the most to do. To make things short, they were terrible also. 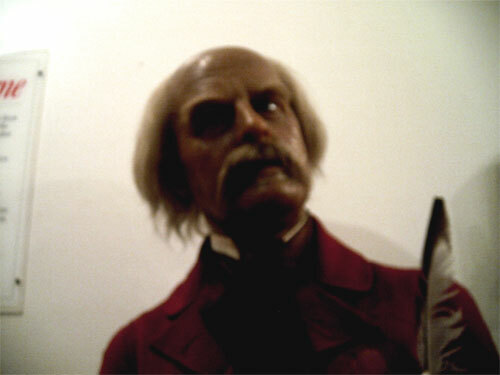 In my opinion, avoid the Wax Museum and its fellow attractions. Our first event of the following day was Cry Innocent. We picked up our reserved tickets and the lady directed us to wait near Salem's mall. There, the actress playing the performance's start and first witch trial victim, Bridget Bishop stood there in character. She was pretty funny whilst staying in character, jesting with passersby. Yet, soon enough a bunch of men dressed in their colonial garb arrested the shrieking Bridget and led her to the large, brick Salem Town Hall. Us ticket-bearing folk were led behind the actors into the town hall, glowing with brass chandeleirs and lined with wooden benches. Judge Hathorne questions actors who serve as witness to Bridget Bishop's witchcraft. Bridget rolls her eyes, gives cheeky retorts and keeps a tight grasp on her position as the show's 'star.' There is some slight audience involvement with some questions taken and ultimately we get to vote on whether Bishop was innocent or guilty. This time, we changed history by voting her innocent. It was a nice, interactive display of history. How can you not go on a ghost tour during Halloween in Salem? Well, I can't and the fact that there is a plethora to choose from, it's hard to know which. So, my friends read through the tours and decided this one sounded best and reserved our spots. 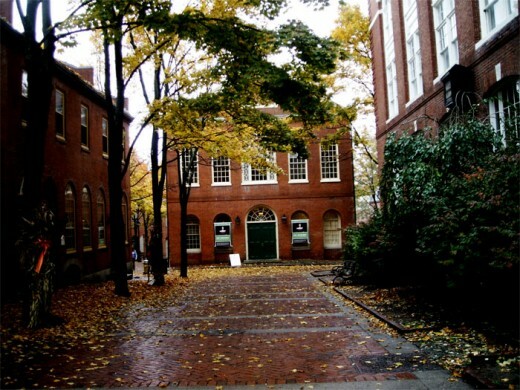 The tour is held appropriately at night where we gathered at its starting point and were told we would be led to four haunted locations in Salem. Unfortunately, though our tour guide had a microphone, the street was littered with noisy drunkards. I couldn't hear the first half, and then it started pouring as we were in an alley next to a haunted house. I guess it set the theme with all the rainy gloom (as if it could be helped). It delivered what you would guess for a ghost tour: haunted houses' history and apparent ghost stories. Expect plenty of walking. One of the Haunted Foot Steps' houses--apparently spirits show up in windows. 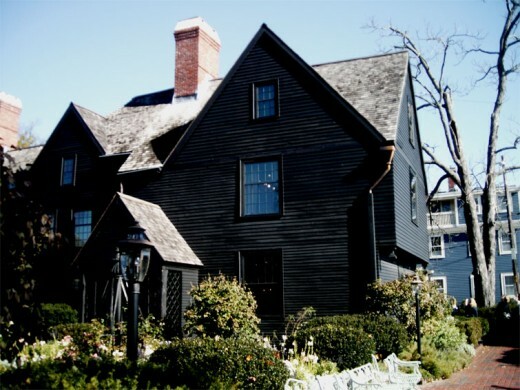 You can't go to Salem and not visit the infamous House of Seven Gables immortalized in Nathaniel Hawthorne's The House of Seven Gables. 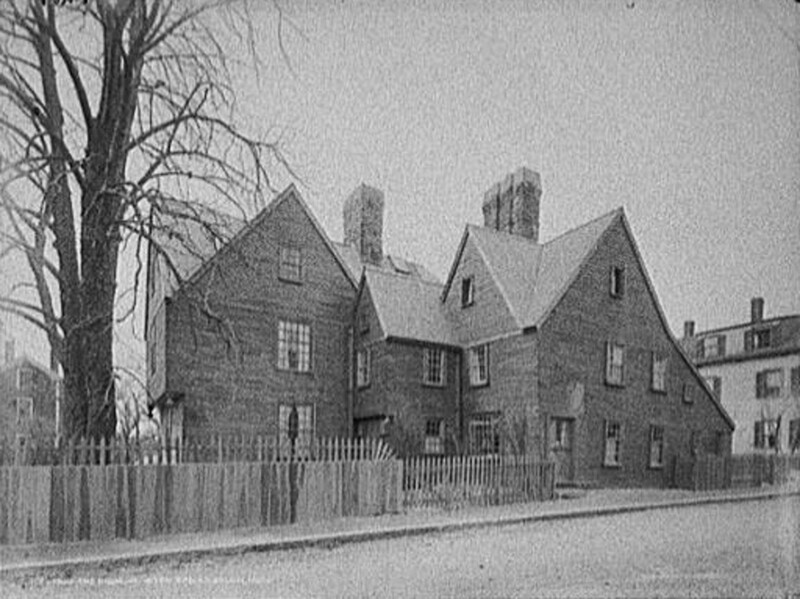 This beautiful house, seated next to the house Hawthorne was born and along an immense body of water, the area epitomizes how Salem probably looked during the witch trials. Not to mention it was the most beautiful location we visited in the city. The House of Seven Gables Sits Behind Its Garden. The House of Seven Gables tours were the best we experienced. They are totally worth the dough. This tour allows you to go into the House of Seven Gables. The house was beautiful with its woodwork, dusty antiques, and unique architecture inside and out. However, the ceilings are low so if you are tall expect to crouch. 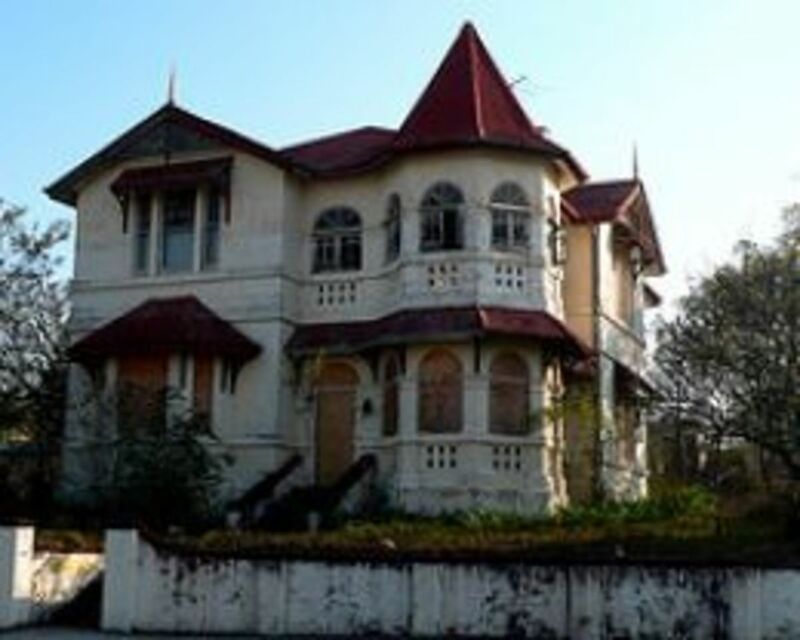 The tour is based around the Hawthorne's classic book, and starts with the ghost of character Maule. 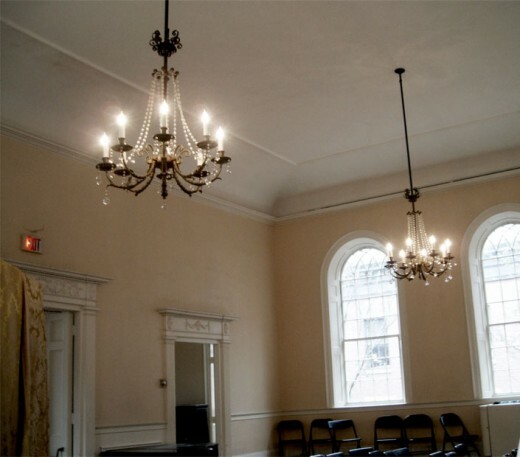 You then are sent through each room and meet all of the 7 characters of the book who summarize the story. The actors were surprisingly great, especially the lady who played the ever-scowling Hepzibah. 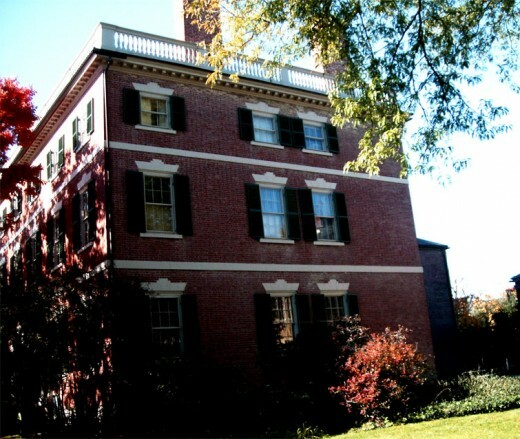 The other tour takes you through the Nathaniel Hawthorne House. 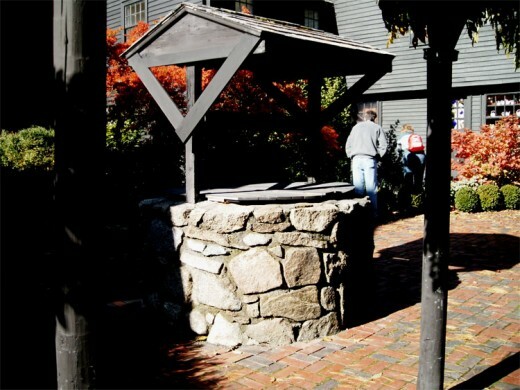 The tour has you meet the accused and accusers of the Witch Trials allowing you to get each side of the story, some history and a great show. Since both tours are at night, unfortunately pictures are not possible outside (or inside--it is not allowed). Yet, I was told that aslong as you save the sticker for the tour, you can come back the next day and get a visitor pass to explore the grounds. And, visitors absolutely should. Not only are the two houses a site, but the beautiful garden, lakeside and the famous Maule's well are breathtaking. 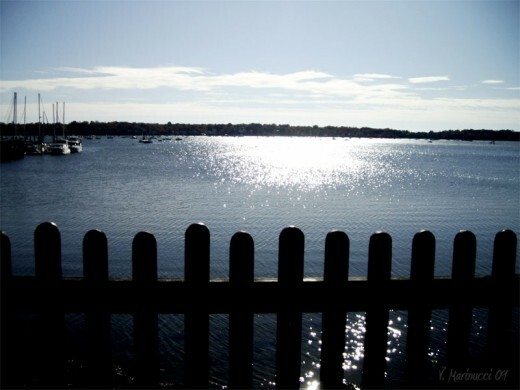 A view from the House of Seven Gables' garden. This cemetery, located on Charter Street is from 1637 and is said to be the second oldest cemetery in the country. With its gate made of what looks like bundled, wooden stakes, distinct grave stones and of course, its residents like the infamous Hathornes, this site is a must to visit. 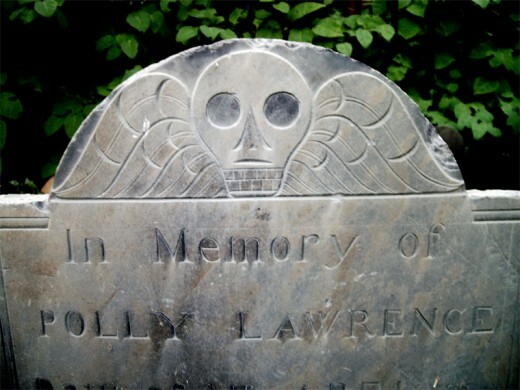 The common carving of a winged skull found in the cemetery. Located at the edge of the cemetery is a stone memorial remembering those who died accused of witchcraft. There you will find boulders with each victims name and cause of death as well as flowers, notes and other gifts strewn on the victims' stones. At the edge of the memorial it reads: "I am no witch." 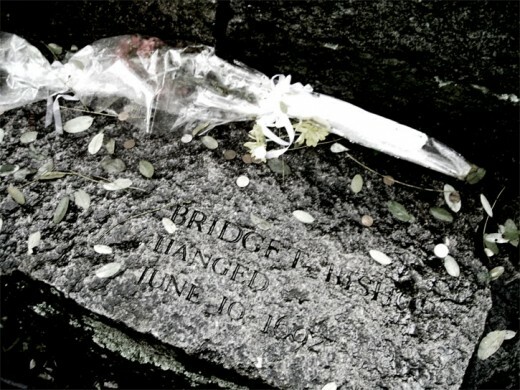 In memory of Bridget Bishop, the first to die in the trials. Need eccentric Halloween decorations? Salem has it. From handmade witch hats, spooky costumes for you (and your pets), to cute or gory décor, Salem has it. It also has all the Salem-themed clothing, mugs, key chains, shot glasses and any tourist merchandise you can dream of. 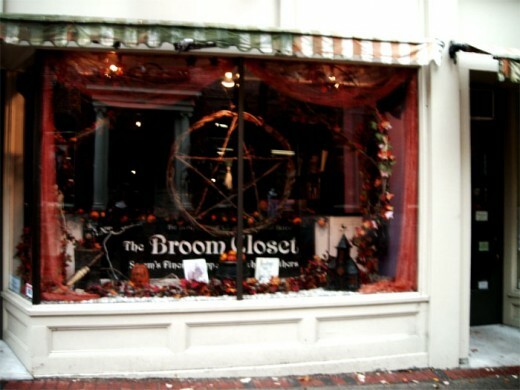 Also, if you are a Wicca or looking for some witchy fun, there are witch shops on every corner. Cauldrons, herbs, wands, and knives at surprisingly good prices (They matched the prices or were less than the witch shops here in PA.). One of a zillion Wicca shops. Last Thoughts: Does Salem Measure Up To All The Hype? It surely sets the mood for fall and Halloween, but they could definitely do without the carnivals and tourist trap parks. It cheapens such a historical place. Yet, the city has a certain, olden charm amid the tourist traps and there is always something festive to do. But, research, book and reserve your spots early because things fill up quickly. Hey Chloe; that's awesome. Oh, and I didn't even think of that. Thanks for the suggestion because I think I'll be putting some hotel/places to stay now! Great hub! I love Salem! My family and I go up every October for Haunted Happenings. You pretty much covered everything there is to do and see. The only thing you're missing is a list of places to stay while there. I highly recommend the Salem Waterfront Hotel. 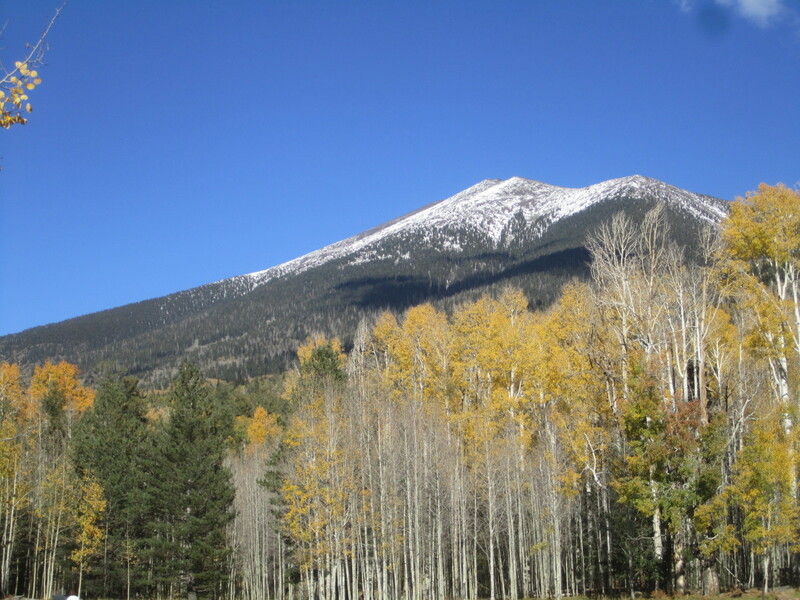 Rates are reasonable and it's within walking distance to EVERYTHING. Just park your car and forget about it. Already made my reservations for October 2010. Kudos! nice information. It looks scary place. this is great hub, complete with the picture. Nice Hub. This is one of those places that I always think of when my mind tells me I need to get away to someplace as strange as I am. I have yet to make the trip, but your hub provided me with plenty of great info for when I get the chance! Sounds like a good day out and some atmospheric photos too.